Crafted from both a philosophical and scientific approach of deconstructing and then reconstructing the common motivations and creative seeds behind The Big Thing projects we aim to complete in our lives. While I found this book extremely interesting from a analytical approach, I must confess that the author’s step-by-step process on how she completed this book (her Big Thing) was a tad bit distracting. 1) Is your Big Thing something that truely means so much to you that you can’t see yourself not doing it? 2) Are you willing to put in the time, patience and perhaps money it will take to finish your Big Thing? 3) What are you hoping to get out of this Big Thing once it’s finished? 1) Anchoring your Big Thing with deadlines, or personal mile markers, you set yourself as a way to keep you on track. As Korkki explains she did for this book. 2) Enjoying the process and have fun. The journey to complete your Big Thing is one that once taken, will forever stay with you. I remember the journey I took to complete my first feature screenplay. I learned so much about myself, the craft and my characters. As unfamiliar and intimidating as the entire process was, I loved every minute of it and I cannot wait to do it all over again. 3) Taking the time to mentally and physically prepare yourself for the project and know how much can do when and where depending on what stage you are at in your life. I plan to work on a few book series project, but I know that I am not at stage in my life to tackle it or properly devote enough time to it as writing a book would be new territory for me. 4) Remember that there are no age caps or starting points for a person to begin working on their Big Thing, just as long as you do it. Overall, I was able to take away from this book a new way of assessing my Big Thing projects and how I should go about them in the future. Happy to say that this book will have a long book shelf life for anyone who needs sparks of inspiration or guidance when it comes to creative road blocks. 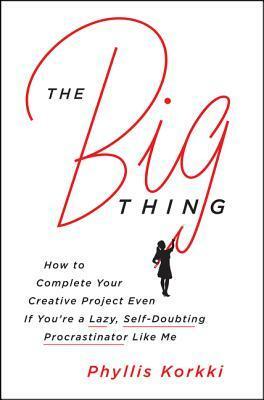 Additionally, I found this book to be authentically honest about what it takes to fully devote yourself to large projects, how it’s okay if some of us just aren’t built to follow through with our Big Things and the feeling of euphoria gained once we reach the other side of that seemingly peak-less mountain of our Big Thing. So, what about you? Do you have a Big Thing you’ve always wanted to tackle? Phyllis Korkki is an assignment editor and reporter for the New York Times Sunday Business section. I like that the author acknowledges that not everyone is built to thrive on achieving those big things – I think that is important to realize so we don’t hold everyone to the same standards of achievement.